A Far Cry founding member and violinist Jesse Irons described Friday’s, Gargantua: Storytelling with Robert Pinsky, as “veal shank” followed by “curly fries”. High and low art mingled well in a program that paired Arnold Schoenberg’s Verklärte Nacht with Jean Françaix’ Les inestimable chroniques du bon géant Gargantua. Boston University professor and former United States Poet Laureate Robert Pinsky, joined the ensemble in Jordan Hall, reading poetry and providing narration. Whether in haute cuisine or fast food, the Criers energized the outing with the sophistication that we have come to expect. Robert Pinsky opened by reading a translation of Richard Dehmel’s “Verklärte Nacht” (Transfigured Night), the poem that provided the inspiration and title for Schoenberg. In the poem, a woman walks along a path with her lover and confesses that she is carrying the child of another man; after some hesitation, her lover reassures her of his constant love for her and that he will raise the child as her own. The composer utilized the poem as the program for his Opus 4 string sextet which—although staunchly written in extended Late Romantic tonality, far from the rarified musical language of his twelve-tone system—shocked and horrified its audience in the 1902 Viennese premiere which, as the composer remembered, “hissed and caused riots and fist fights.” Despite its rocky early reception, Schoenberg continued work on the piece. The string orchestra version of the single-movement tone poem much more vividly than the original sextet (set for two violins, two violas and two cellos), coaxes a broader range of dynamics from the full complement of string instruments by contrasting solo instrumentalists against the full orchestra. Despite these gains, much is often lost in performances of the string orchestra expansion—inclusion of double bass to the ensemble adds heft to the lower voices which frequently translates into a muddy sound; a stricter tempo that is necessary for a larger ensemble can feel restrictive, preventing much of the subtle expression possible in the original sextet. Many of these pitfalls were certainly present in Friday’s performance—although muted, the lower registers still seemed blurry, and, at times, I wished that the conductor-less ensemble could push ahead and embrace the rapture so evident in the score; a slower tempo sometimes felt unnecessarily reserved. Still, AFC compelled, as strong lyrical lines presided over the substantial lower strings; pellucid arpeggios in the final moments provided an ethereal aura. 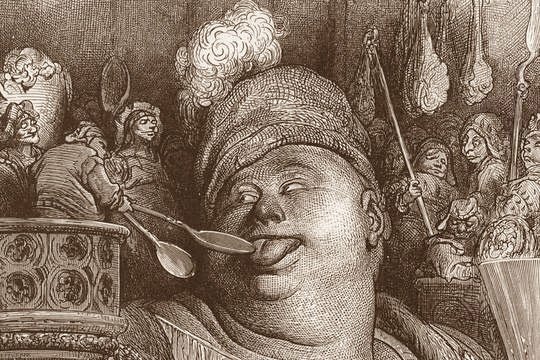 Pinsky returned in the second half in a more substantial role as the narrator for Jean Françaix’s Les inestimable chronique du bon géant Gargantua, an adaption of François Rabelais’s 16th-century satirical novel La vie de Gargantua et de Pantagruel. Françaix’s adaptation conveys the early life of Gargantua, swooping from an Ovidian creation myth of the giants to a Biblical genealogy that culminates in Gargantua’s being born to the giant, the Lord Grandgousier. Gargantua grows up to study at the Sorbonne, but after finishing, is conscripted into a battle against the bakers of the Lord Picrochole. Françaix sets the drama with playful wit, draping the musical drama around the narration. Françaix’s musical language strives to be familiar, frequently incorporating folk melodies and even the odd Dies Irae, but is fundamentally ensconced in the musical language of mid-20th-century France, smoothly incorporating jazz-like sophistication into its harmonic backdrop. Pinsky read Laura Marris’s translation with amused humor (at times I could imagine Bernstein’s recording of Peter and the Wolf) that was matched from the orchestra with an eager confidence and energy. The successful collaboration garnered multiple boisterous laughs from a rapt audience. A Far Cry continues its 2015-2016 season with A Tale of Two Sixes—the opus 6 concerti grossi from George Händel and Arcangelo Corelli—on December 5th in St. John’s Church.